Scarce nautical chart of the middle part of the Florida Keys. Coast Chart No. 168 Florida Reefs From Long Key to Newfound Harbor Key. 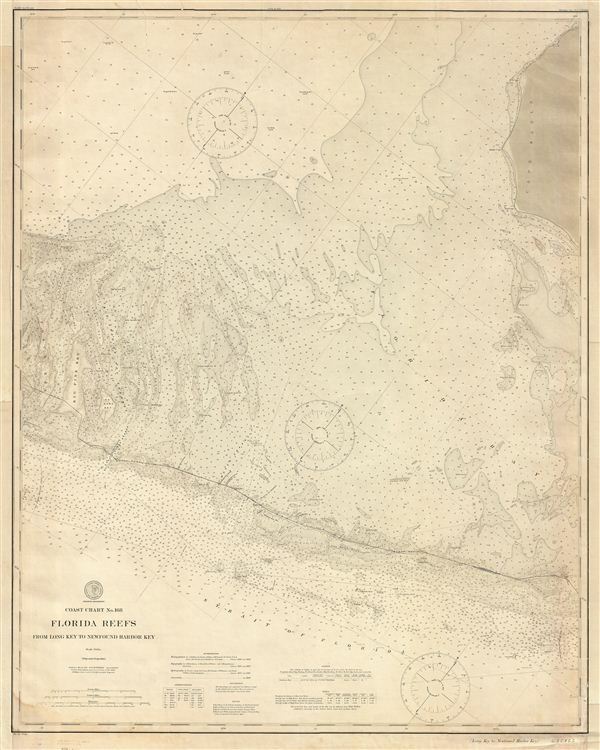 A scarce 1908 U.S. Coast Survey nautical chart or maritime map of the middle Florida Keys and Florida Bay. The map covers from Long Key to Newfound Harbor Key, and includes Torch Key, Big Pine Key, No Name Key, Little Pine Key, Johnson Keys, Bahia Honda, Duck Key, Molasses Key, Pigeon Key, Knights Key, Hog Key, Key Vaca, Boot Key, Fat Deer Keys, Crawl Keys, Grassy Key, and of course Long Key. The chart offers a wealth of detail including impressive inland detail and countless depth soundings. Shading further highlights shallow areas along the coasts - where instead of fathoms, all sounding are represented in feet for greater accuracy. The upper right quadrant offers a wealth of practical information for the mariner, including notes on tides, lighthouses, buoys, and soundings. Published by the United States Coast and Geodetic Survey under the superintendence of W. W. Duffield. Good. Map has been professionally restored and backed with fine linen. Some margins extended.